Type of Friedberg 64-68 (W-650-654). 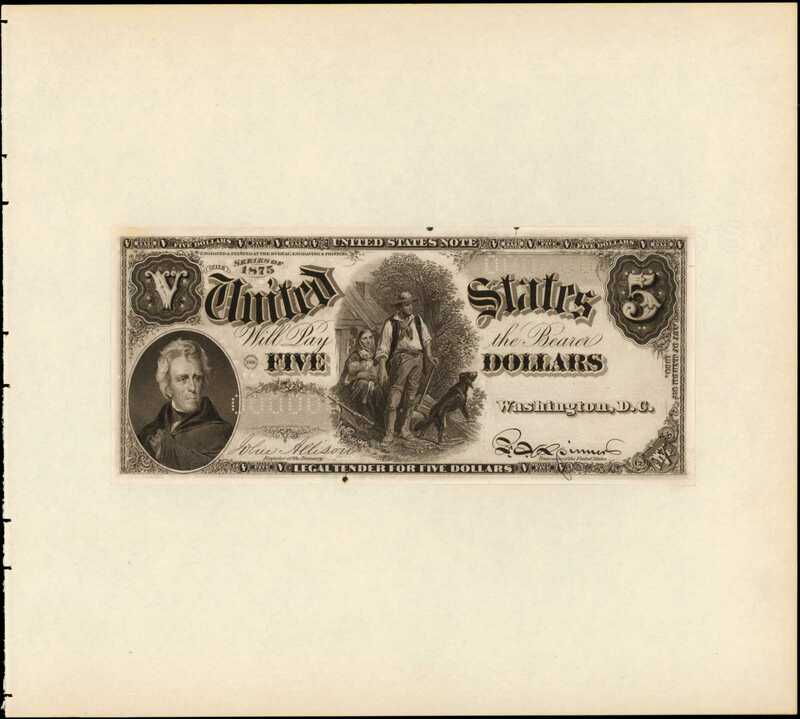 1869-1875 $5 Legal Tender Note. PCGS Currency Very Choice New 64. Face Essay Proof.Hessler-Unlisted. India paper on wide margin paper. Imprint of Bureau, Engraving & Printing. Black and white portions of the face only. Style and designs of the traditional Pioneer Family, nicknamed "Wood Chopper" notes. Center, man holds axe, wife and dog in front of home. Lower left, Andrew Jackson. Engraved signatures of Allison and Spinner. Left of vignette, "Patented July 24, 1866" as used on the 1869 "Rainbow" plate. Zero numbers perforated in both serial number blocks. An extremely important transitional essay proof, not known in issued form. The signature combination is that of the 1869 "Rainbow" series notes. Quite possibly the only example in private hands. Superbly printed, but we note some small ink splatter spots in the top and bottom margins that are not intrusive at all. A showpiece proof of one of Americas favorite currency designs.pFrom Stacks Americana Sale, September 30-October 2, 2010, lot 1063.